Home > Contest > Contests > Contests India > Free Stuff India > IPL > IPL 2018 > IPL TICKETS > IPL WATCH LIVE > Lucky Draw > Sports > T20 Cricket Moment > Win Prize > IPL 2018 Moments Win an Amazon Echo Dot EVERY DAY! IPL 2018 Moments Win an Amazon Echo Dot EVERY DAY! IPL 2018 Match not watching at Stadium Then Have your turned your home into your own stadium? Comfortable seating tasty treats and crazy support along with friends & family isn't that the perfect way to enjoy your favorite game? Shoot a Video or Click a picture of one of these moments and stand a chance to win an Amazon Echo Dot Every day Free. We Are Leading Page In Online Contest, Free Sample, Freebie Deal Loot, Recharge Tricks, Offer, Coupon etc. MaalFreeKaa.in No. 1 Website in News Media About All Online e-Commerce News Update. You Grab Daily Awesome Freebie Product or Prize When you Play our Publish Online Giveaway and Free Sample Claim. Now We Leading Page in IPL 2018 Contest You Can Play IPL Contest and Get Free Official IPL Team Jerseys, T-Shirt IPL Match Tickets, Top 5 IPL Player Ranking And Much More. Click a picture or shoot a video of yourself, your friends and family enjoying watching a match of cricket at home. Kyunki jab ho cricket ka season, toh bann jata hai Har Ghar Ek Stadium. Are you guys excited? Delhi, Mumbai, Chennai, Bangalore, Hyderabad, Rajsthan, Punjab field set karo aur tayyar ho jao! To participate in the contest The Cricketing fever is upon us and we cannot keep calm! Grab your kits, set your field, and put your best foot forward to turn your home into a stadium. 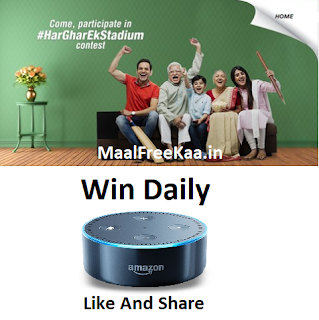 Participate in the Har Ghar Ek Stadium contest and stand a chance to win an Amazon Echo Dot every day! Note : Don't forget to add the slogan "Aao kabhi _________ ke stadium pe" to your video/image. You can fill in the blank with your name or any name that you feel fit for your home stadium. No purchase is necessary for participating in the Competition and it is open to all and Free Entry.
. Contest duration will be from 24th April to 20th May, 2018.